It’s been a little over two months since we got our first and only major glimpse at Solo: A Star Wars Story. Disney and Lucasfilm offered up an update yesterday with a far more substantial look at Han Solo’s standalone origin film. 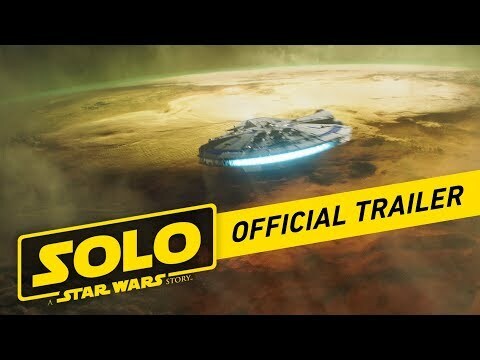 If you’re tired of the vague details coming out of the latest Star Wars production, this is the trailer for you, fleshing out a lot of what we can expect when everyone’s favorite scoundrel returns to the big screen next month. It’s still a trailer, so there’s only so much it could possibly give away, but this latest ad definitely piqued my interest. There’s way more exposition, giving us a fairly clear sense of what promises to be the first Star Wars heist film. If Rogue One was Battle of Britain, Solo is shaping up to be Ocean’s Eleven or The Italian Job. Add to that a rag-tag team of brigands, the triumphant return of Lando Calrissian (via Donald Glover), and some impressive action set pieces, and you’ve got what looks like a decent Star Wars outing. So, what did we learn about Solo: A Star Wars Story from the new trailer? Solo star Alden Ehrenreich has inspired misgivings for a long time now. Last June, soon after original Solo directors Phil Lord and Chris Miller were fired, to be replaced by Ron Howard, The Hollywood Reporter reported that Lucasfilm had hired an acting coach for Ehrenreich after some dissatisfaction with his performance. That move certainly worried fans, prone to imagining the worst in a case like this. Hope was never entirely lost though, especially as the original Solo himself, Harrison Ford, not only helped coach the young actor but also gave his own seal of approval. Until now, it’s been hard to gauge Ehrenreich’s performance. Earlier Solo teasers were conspicuously light on actual lines from leading man Han Solo, relying more on filling in the world around him. This newest trailer offers a lot more of him, though the results aren’t all that promising. A straight Ford impersonation would be a terrible idea, inviting audiences to pick apart every little detail of his performance, so kudos to Ehrenreich for giving the role his own spin. On the other hand, his flat, monotone delivery of most of his lines don’t feel quite right. He’s playing up the space-cowboy side of Solo by taking on what feels like a Clint Eastwood-inspired stoicism, but it loses some of Ford’s more playful flourishes with the character. Still, there isn’t much to work with in this trailer, and Ehrenreich has shown he’s got acting chops in other projects, so I’m willing to give him a fair shake come May 25. While Ford may have made Solo playful, he was also one of the darkest characters in the Rebellion. This is a man who kills a colleague in cold blood just moments after we’re introduced to him (yes, Han shot first). Han is also a cynic with no time for optimism. He barks orders, refuses to hear the odds (because he knows they’re always stacked against him anyway), prioritizes money over ethics, and never expects to come out on top. This is why the latest Solo trailer’s inclusion of his naively optimistic “I’ve got a really good feeling about this” feels so fresh and amusing. It’s most obviously a play on his characteristic “I’ve got a bad feeling about this” from the original trilogy, but it also hints at a younger Han who hasn’t been worn down by a harsh universe quite yet. The idea of a young Han Solo, looking forward to a life of adventure, is an appealing one. It also means we can probably expect some of the hard lessons that will create the Han we’re more familiar with — it’s tempting to see the clean Falcon, seemingly fresh off the assembly line, as a metaphor for Han, who will similarly be the worse for wear the next time we see him. One of the most exciting teases in the new trailer is the possibility that we’ll learn Chewie’s backstory. In one scene, Han learns that his Wookie companion is 190 years old. His surprise at the number suggests the two don’t know each other all that well yet, so we may get some information about how they met. It’s still not clear how much of the old Star Wars canon will be salvaged, so everything we think we know about life debts and the planet Kashyyyk might be wrong. That means Chewie wife and son may or may not exist. In this trailer, though, we see Chawie embrace another Wookie in what looks like an emotional goodbye. Could Chewie be leaving a wife or partner behind to accompany Han on his interplanetary adventures? We don’t know much about Solo’s leading lady Qi’Ra, played by Game of Thrones’ Emilia Clarke, but the canonical YA novel Most Wanted suggests she and Han have known each other since before the new film’s plot. It seems like we’ve been here before (“rough around the edges” feels like short hand for “scruffy-looking nerf herder”). Qi’Ra may not be royalty, but her higher social standing is a clear contrast to Han’s smuggling, lower class appeal. The film isn’t revealing too much yet though, and she could be an interesting character, with a compelling and rich history of crime shared with Han. Clarke certainly has the screen presence and depth to pull off more than a Leia clone. We know Han is a sentimental guy. He tries his best to hide it (responding “I know” to Leia’s “I love you” in The Empire Strikes Back, for example), but the chinks in his armor aren’t tough to spot. His love of the Millennium Falcon and his loyalty to Chewie are the most obvious examples of this. In this latest Solo trailer, we get a hint that his blaster may mean more to him than we might have assumed. At one point Tobias Beckett, a boss/mentor played by Woody Harrelson, throws the gun to Han after kissing it. The brief moment hints at a lot. On the surface it’s a fun wink to the audience, offering an explanation for a fairly innocuous but iconic prop (akin to the opening scene of Indiana Jones and the Last Crusade). If Han felt the need to hold onto the blaster all these years, there’s a good chance it means something to him. And by extension, there’s a good chance Beckett is more than just a friendly acquaintance. Hopefully we can expect a few other Easter eggs like this. And finally, we get the person I can only assume will be Han’s main rival, Dryden Vos, played by Paul Bettany (stepping in for Michael Kenneth Williams, who wasn’t available for reshoots when Howard came aboard). Vos is the “big shot gangster” who has hired Beckett to assemble his team. And he’s a scary-looking gangster at that. We can assume from his presentation that he’s not the greatest guy to work for. Not only does he look terrifying and angry, with mysterious scars all over his face, but he also wears all black and brandishes an energy weapon that flashes red, two familiar visual markers of the Sith in the Star Wars Universe. This is our first glimpse of Vos, and while I’m sad we won’t see Williams in Solo, I’m excited to see Bettany chew the scenery and (maybe) stand in Han’s way. What do you think? Any fears about Solo? Anything you’re especially hoping for or looking forward to seeing on May 25? Sound off in the comments. The standalone Star Wars movie about Han Solo's younger years has wrapped production. It also got an official title.